Throw Like the Pros! The Radar Pitching Trainer is a one-of-a-kind new product that combines a pitching target with a sonic radar ball speed indicator and a virtual umpire for the ultimate pitching experience. 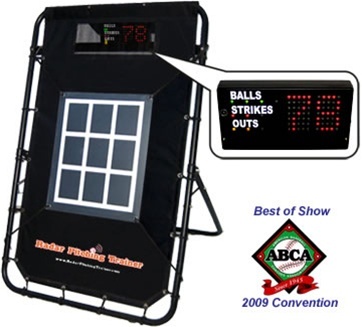 Keep track of pitching statistics – Pitch Count, Strikeouts & Walks – with the trainer’s large “Electronic Umpire” display. Have fun with some healthy competition – statistics are maintained for one or two players. Whether you play Little-League or Pro, baseball or fast pitch softball, the Radar Pitching Trainer is your comprehensive pitching solution! Radar for baseball can be set for 45' or 60' 6"
Need more info? View the Instruction Manual here.